A couple of weeks ago, we got ourselves a RetroFreak, a 15 cartridge/card format reader retrogaming console manufactured by Cybergadget (a Japanese company specialized in devices for gaming and retrogaming performance), we decided to give it a try and review it for you. We must start by saying retrogaming reader devices were not having it easy in the last years, mostly because of AT Games poor performance cheap releases (we reviewed a couple, so you can know how bad they were doing). Luckily, a company like Hyperkin took things more seriously and started to release Retron console versions, which have become great in allowing read and run old cartridge games through emulation. Yes, it is emulation, only original hardware can run these as they are, but even though it is pretty good and accurate, which is practical even for new generations, nonetheless, more affordable than buying all featured consoles alone. But we’ll get more on that discussion further on in the review. Japan’s response to the Retron was the Retrofreak, which by all means was catalogued immediately as a “Retron killer” by most media outlets, because it offers a little bit more than the other. But, does it stand to the mentioned title? Let’s find out! The console comes in a pretty box that reminds us of the Game Cube and Game Boy era design packages (extra points for the cute pixel wolf mascot). The console includes 1 controller, an HDMI cable, Retrofreak’s own controller, an old console controller port box add on, a USB cable, and its power supply cable. Once we have our hands on the console we find its design is practical, it almost fits in my hand’s palm and it is easy to carry, doesn’t take much space and it is not as bulky as the Retron, this is way more elegant. It has the following cartridge ports: Genesis / Mega Drive, SNES/SFamicom, NES/Famicom, Game Boy / Color, Game Boy Advance, and what’s the main difference with the rest in the market, PC Engine / TurboGrafx 16 / SGX. 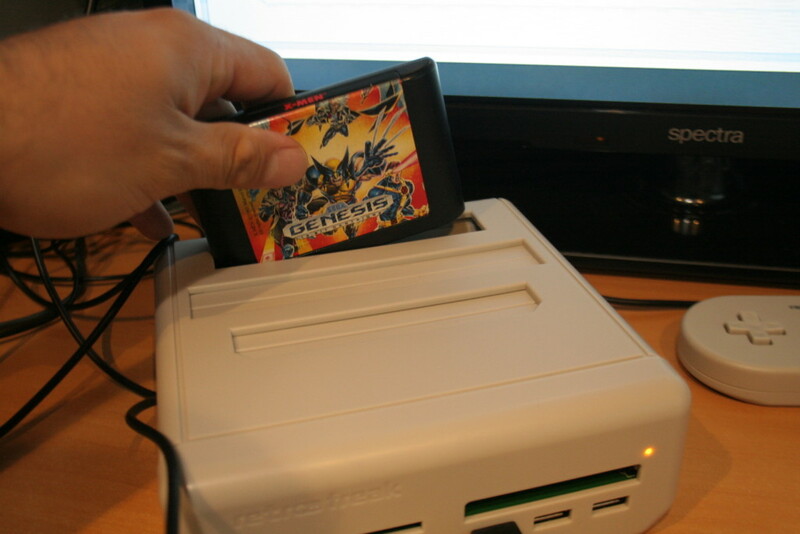 Retrofreak doesn’t have the SG 1000, Master System, SEGA My Card, and Game Gear reader built in, but the add on device will be released on February 2016, even so, the Retrofreak is already able to read such games, thanks to a day 1 update release for its firmware, or… once this update is installed, you can plug in your own SEGA Power Base Converter and start playing some of those (like I already did). I’ll explain how to do such firmware update further on this review. The usb control is based on the Super Famicom one, which might end up being kinda annoying to use for the SEGA console fan / player, so in this case we must say the Retron’s own design is more practical, offers more comfort since it has an ergonomic form and uses a thumbstick instead of a D-Pad, plus bluetooth wireless support. But in all honesty the best way to avoid delay is to use a corded controller. Now, there are pros and cons for the retro controller port box. The RetroFreak only comes with 1 of these, while the Retron has 2 of each built in, it might end up being annoying to get/import another one. But, on the other side, what’s cool about this device being separate, is that you can plug and play for other devices such as PC, some tablets, and PS3, the device gets immediately recognized by Windows for example. So if you want to use your Genesis controller on emulators like Kega, you can do so now. The console also allows you to plug your PS3 controller but has no XBox 360 usb controller support, which is a shame since it is the most used controller for PC. The RetroFreak comes with a built in 3.1 GB free storage capacity, but it also comes with a Micro SD card port for more (card sold separately). Now, for those of you who already got the console or are planning to get it, here’s an explanation on how to update the firmware since the instructions on Cybergadget’s page are in Japanese. 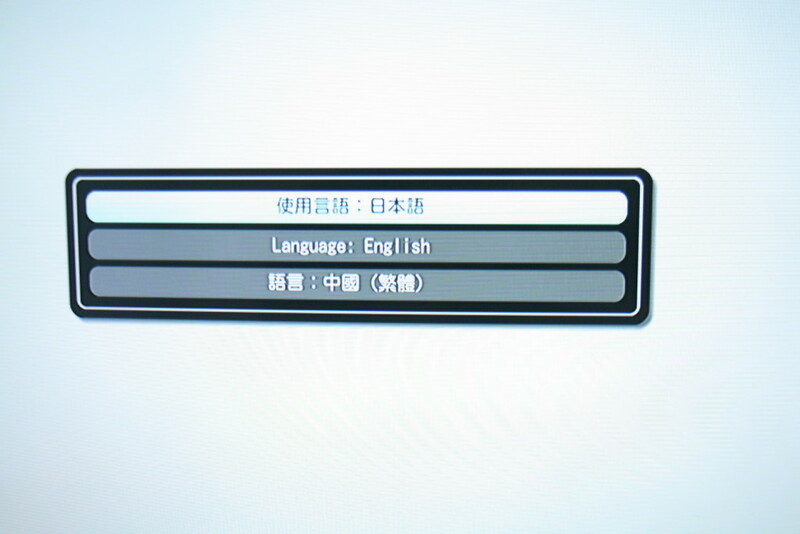 First, you’ll require the Micro SD card to be in the console, then go to SYSTEM > WRITE FIRMWARE UPDATE REQUEST, once the request file is written in your card take it to your pc or mobile device and download the file from this link in the same main directory after choosing the request file. 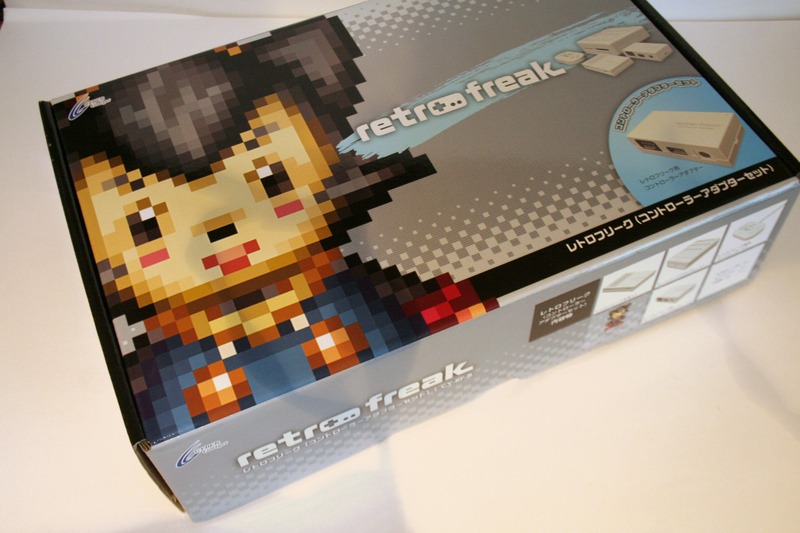 Where the RetroFreak stands from the rest is its neat interface and great game emulation performance. While it offers most of the game settings Retron has, RetroFreak has a better way to present them with a well designed and friendly interface and a very accurate game performance, the closest to the real hardware I’ve experienced so far for any of these devices. You choose a wide range of video and audio settings, which have filters, previews (which is very helpful to know how the game is going to look like by choosing these), region, refresh rate, scanlines, control mapping and response rate. I found my optimal config the following one: No filter, scanlines on, 60 hz, normal aspect ratio, Overscan ON, Console region Auto (which enables to play all regions on the go), sound enhancements and GUI sound effects ON. This device handles control precision, accurate colors and audio, gives an enjoyable experience. One of the cool features is that the console allows you to dump the cartridge game into the card’s memory, that way you’ll be able to backup your entire library or get games your friends lend to you. Most retro games are expensive these days, you know? So this feature is a total money saver. You can just turn on the autosave into memory (whether card or internal) once a cartridge is plugged, or do it manually. It can only read 1 slot at a time so don’t plug all console types at the same time. While Retron has these features too, after trying both, I can say the cartridge slot pins of the Retron are too tight, you have to treat those like a demanding lady, while the RetroFreak allows us to easily pick in and out, dumping game time takes more time on the Retron (while it’s just seconds of difference), and the RetroFreak allows us to remove the cartridge and play without it even during gameplay while the Retron 5 doesn’t. Retrofreak’s file manager is a lot more friendly too. Both can’t recognize the Master System controller even though it has the same port as the Genesis one. In the last couple of years, retrogaming has acquired more relevance, it is great that new generations are digging into the past to learn about the base for a lot of titles. Publishers throw remakes or back catalog ports for current gen consoles more often, but sometimes it is not enough, mostly because a lot of the publishers don’t exist or don’t have rights to publish them anymore (like the Konami TMNT licensed games), or sometimes certain titles are not popular enough for a company to invest in a port. So, in order to play those titles one must get the original hardware and the cartridge, which also generates may other problems. First, getting all the old consoles or cartridges, which in some cases might become quite expensive (like trying to get an American TG16 these days, which forces you to get a Japanese PC Engine), a problem that becomes even bigger for other countries where these were not released. Then would be having a decent display on current gen TVs/Monitors, since these old gen games were affected by scanlines on CRTVs, displaying these not only generates more steps which cause delay but also having to get expensive upscalers. Therefore, emulator consoles have 3 selling points: practical, easy to set up, and AFFORDABLE. It is true, original hardware on CRT still is tops, but options like these enable comfort play setups for modern standards and displays. It is up to your own preferences. In my case I’m comfortable having the original and this one for a quick setup on a modern TV still providing me a very enjoyable experience. The more options the merrier, isn’t it? The RetroFreak offers a very enjoyable experience for running most of your old cartridge game library, has neat features that allow you to get the most of it. And if you look at the overall picture it does offer more than the Retron currently does. – Reads the most formats for a device like this including PC Engine/TG16 which is a selling point. -Neat and friendly interface, slick design, English support, lots of great settings options. -Most accurate old game reproduction so far, very close to the original hardware. -Bad default controller, comes only with one retro controller port box (people have friends you know? ), does not recognize the Master System one. -No Xbox 360 Controller support, even though is one of the most reliable ones for PC. Interested? First 3 batches sold out, but you can still get one from the 4th batch through AmiAmi.